The Zeus MD Series consists of systems that are fully automated with a full PC built-in along with a Windows operating system and all the necessary software and drivers all preinstalled. The Zeus MD systems are also configured with 2 or 4 drives, inkjet or thermal printer, and 220 up to 630 disc capacity (depending on the printer). 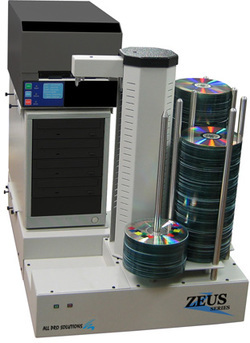 The systems provide automated disc burning capabilities to easily, efficiently, and economically create stunning CDs or DVDs for referring physicians or patients. Published discs are each uniquely labeled and can include the full-fidelity images, DICOM DIR, Html pages, multiple viewers, Profiles, Web Access, AES 256bit Encryption, Drag&Drop, and more. Normal publishing of CDs and DVDs can also be executed using the Zeus MD’s sophisticated publishing software. Users can install the Server application on the host PC, and connect from additional Client applications installed throughout networked PCs network-wide. The user-friendly interface allows for creation of CDs and DVDs easily and efficiently. The system allows for unlimited production jobs, user management, and email notifications. The integrated label editor also provides users with an interface to easily create stunning disc labels.